Synthetic peptide within Human Retinoic Acid Receptor beta aa 1-100 (N terminal). The exact sequence is proprietary. Our Abpromise guarantee covers the use of ab15515 in the following tested applications. WB Use a concentration of 1 µg/ml. Detects a band of approximately 50 kDa (predicted molecular weight: 45 kDa). ab15515 staining Reinoic Acid Receptor beta at 1/100 dilution in human testis by Immunohistochemistry (FFPE-sections). 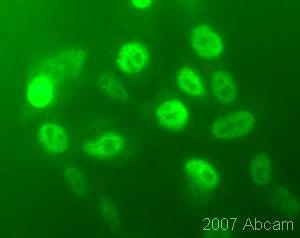 ab15515 at 1/100 staining hamster CHO-K1 cells expressing human retinoic acid receptor by ICC/IF. The cells were formaldehyde fixed and blocked before incubation with the antibody for 1 hour at 22°C. A FITC labelled goat anti-rabbit antibody was used as the secondary. Publishing research using ab15515? Please let us know so that we can cite the reference in this datasheet. How about specificity? I have tested several ab of RAR-beta from different companies for western blot. Your ab can be used for western blot? Thanks. To our knowledge, this antibody has not yet been tested in WB.